← Your own flavor standards, for a price. Brewer’s yeast (Saccharomyces cerevisiae) typically produces significant amounts of diacetyl during fermentation. Diacetyl is created by non-enzymatic oxidative decarboxylation of alpha-acetolactate, which occurs outside the yeast cells . Alpha-acetolactate is produced as part of the valine anabolic pathway (the reaction pathway yeast use to create the amino acid valine), so it’s clear that valine has a very important role in diacetyl formation by influencing the yeast’s ability to produce or reduce diacetyl levels. This influence is demonstrated by the fact that the enzyme which produces alpha-acetolactate is directly inhibited by the presence of valine, so when the yeast’s internal valine levels are high enough this enzyme is inhibited and total diacetyl production is reduced. Since valine is an amino acid (one of about 20 protein building-blocks), then it stands to reason that protein levels in wort will exert an influence on diacetyl formation during fermentation, and this has been shown to be the case. Worts which are deficient in free amino nitrogen (FAN; important nitrogen/protein nutrient sources for yeast which are derived from the malt) are therefor also deficient in valine, and it’s been demonstrated that low levels of FAN in worts can lead to elevated diacetyl levels in the final beer. Since there is less valine for the yeast to take up, this leads to more activity of the enzyme which produces alpha-acetolactate (acetohydroxyacid synthase), which in turn leads to more extra-cellular alpha-acetolactate and results in high levels of diacetyl. Regardless of how much valine (or FAN) is present in the wort, diacetyl is always produced during fermentation, but as yeast complete the fermentation process they begin to take diacetyl back up into their cells and reduce it (chemically and quantitatively) through enzymatic action into acetoin and 2,3-butanediol (both of which have higher thresholds than diacetyl, which means don’t play as much of a role in beer flavor). If one were to plot diacetyl levels through the course of a fermentation, it would go from zero to somewhere in the hundreds of parts-per-billion in the first few days before it begins to drop (roughly 50% per day, depending on yeast strain and temperatures) to levels well below 100ppb. This is how brewers, especially the bigger ones, can tell when their fermentations are complete and ready to be chilled and filtered: the diacetyl levels drop off precipitously. This is usually done with a gas chromatograph set up specifically for this task, although there are other methods for measuring diacetyl which are a bit dated and less accurate. Yeast flocculation can also influence diacetyl levels in the same way that pre-maturely ending fermentation does: highly flocculating yeast removes or “deactivates” itself before they have a chance to reduce the diacetyl. Combine the variations in flocculating abilities along with the ranges of enzyme production and it becomes apparent that diacetyl production and reduction can vary considerably based on yeast strain. pH, pressure, and temperature all play roles as well. If valine levels in wort are prematurely depleted there is the potential for a second diacetyl peak, some of which will likely make it into the final beer. This is why brewers must insist on using high-quality malt with adequate levels of nitrogen, which, during mashing should lead to adequate levels of FAN and therefore valine. If poorer quality malts are used there is a risk of valine deficiency and high diacetyl levels (among the many other problems associated with brewing with poor quality malt). 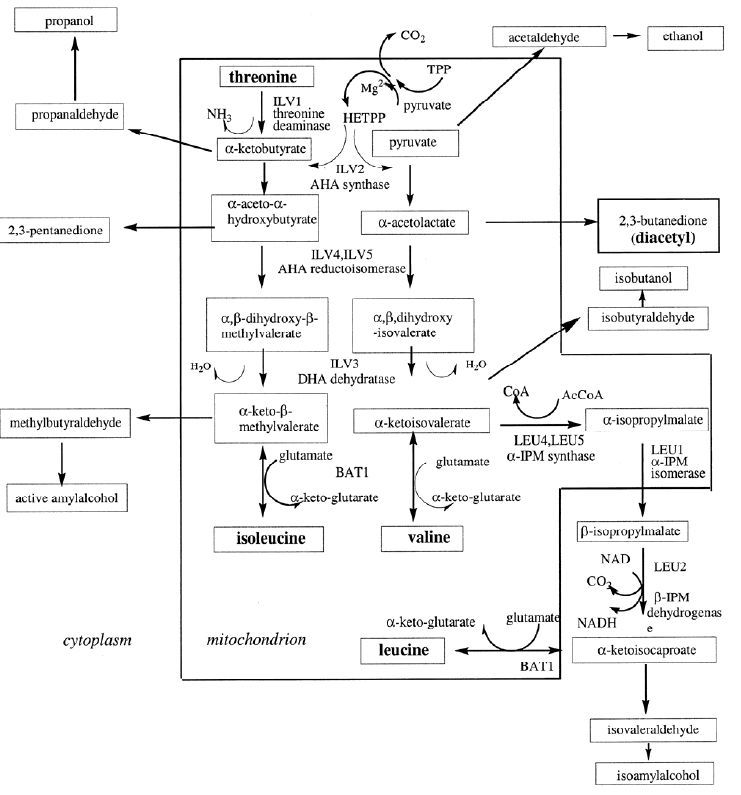 Below is a diagram which shows how diacetyl production relates to other biochemical pathways during yeast metabolism. Isoleucine-valine biochemical pathways leading to diacetyl and 2,3-pentanedione production. From Peterson, et al. 2004. The second-most influential way diacetyl is produced in beer is through bacterial infection. Two main bacterial culprits are to blame for this: Pediococcus and Lactobacillus (Gram-postive/catalase-negative cocci and rods, respectively). Both of these bacteria produce lactic acid, so when the buttery aroma is detected along with a sour character, it is pretty certain that an infection has occurred. The most common source of contamination comes from contaminated pitching yeast, as the bacteria hitch a ride with the yeast from brew to brew and gradually accumulate into populations which wreak havoc on your beer. The final way in which diacetyl is formed in beer is during the aging of the beer. There isn’t as much discussion about this phenomenon as it doesn’t often lead to detectable levels of diacetyl since other oxidation or staling flavors can mask the diacetyl fairly well. This process is similar to the processes which create diacetyl during fermentation: the non-enzymatic oxidation of alpha-acetolactate. This occurs now even without yeast present since the yeast have excreted the alpha-acetolactate during fermentation. This happens more often when the yeast is somewhat dysfunctional; having lost some of the ability to metabolize all the alpha-acetolactic acid leaves more in the final beer which results in the production of diacetyl via an oxidation reaction with other wort constituents (such as melanoidins). 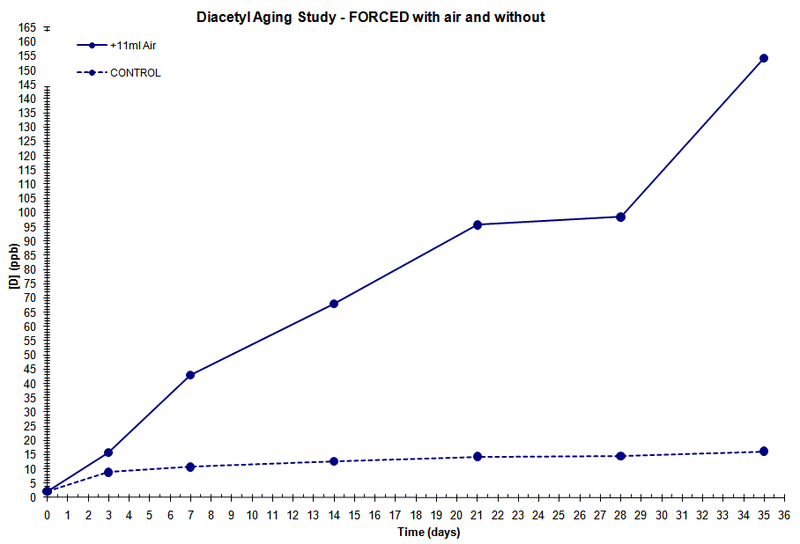 I hadn’t heard of this phenomenon before last year, so here in The Lab we decided to look into diacetyl formation during aging as a potential marker for beer age (or abuse). We found some interesting results. This first chart shows two beers (IPA and amber ale) treated to three different temperature treatments: COLD (refrigerator temperature), ROOM temperature, and FORCED (~85F). The effect of temperature on diacetyl production is obvious. The second chart shows a third ale after having the crown removed, the bottle’s headspace replaced with air, and then being re-crowned. You can see the dramatic effect that oxygen had on diacetyl production. 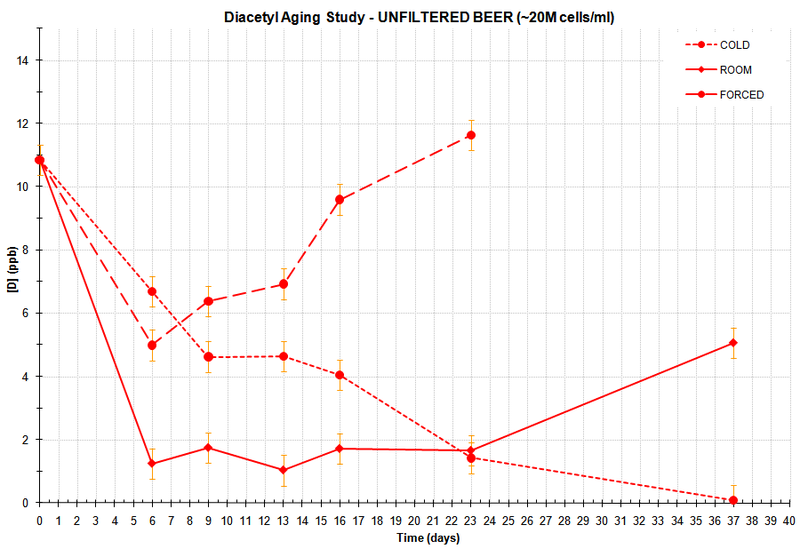 This final chart shows the effect that the three temperature treatments had on an unfiltered beer. This one is the most interesting to me, as it bucks the trend set by all the other beers we looked at and provides good food for thought. It seems that the yeast in this unfiltered beer has a pronounced effect on diacetyl levels in the package. It probably does this in a few different ways: by taking up minor amounts of oxygen left in the package (thereby slowing the affect seen in chart 2 above), by enzymatically reducing diacetyl to acetoin (like at the end of fermentation), and possibly by lowering the alpha-acetolactate levels remaining in the beer (lowering the amount of pre-cursor for oxidative diacetyl formation). The beer which was kept cold had the slowest reduction in diacetyl, likely due to the slower yeast activity, but it also remained low the longest probably because the cool temperatures kept the yeast alive enough to have remained somewhat active. The room temperature sample’s diacetyl levels dropped the fastest. I believe this is because the temperature wasn’t cold enough to hibernate the yeast, but it also wasn’t warm enough to either kill the yeast or “overpower” its ability to limit oxidation. Eventually, this room temperature beer rose above the cold sample, probably because the yeast eventually tuckered out and was unable to “fight” against the normal oxidative processes. The diacetyl levels in the forced sample fell at a rate between the room temperature and the cold samples, possibly due to “normal” oxidation being mitigated by the yeast’s inhibition of said oxidation. After a short time, levels shot up quickly; probably an additive affect of the accumulating oxidation, and the death of the yeast which released a number of compounds into the beer (which likely included more alpha-acetolactate). So how can the small-scale brewer or homebrewer use this information to limit diacetyl in their own products? The problem for small brewers is that they rarely have the $50K to drop on a gas-chromatograph, and therefore have no way of knowing when their fermentation is complete, aside from the cessation of the drop in gravity. This might be alright, most of the time, but if a small brewer lacks the capacity to meet demand, then they may be inclined to chill and package the beer as soon as the gravity stops falling, but this could “trap” a significant amount of diacetyl in the beer since the yeast hasn’t been given enough opportunity to reduce the diacetyl levels. However, even small brewers can afford the best analytical tool(s) when it comes to beer flavor: the nose. It doesn’t take long to train a panel for diacetyl recognition (imitation butter flavoring from the grocery store can be used as a flavor standard), and once you find out who your most sensitive tasters are they can become your walking, talking gas-chromatograph. : Peterson, E., Margaritis, A., Stewart, R., Pilkington, P., Mensour, N., The Effects of Wort Valine Concentration on the Total Diacetyl Profile and Levels Late in Batch Fermentations with Brewing Yeast Saccharomyces carlsbergensis, J. Am. Soc. Brew. Chem., 62(4): 131-139 (2004). This entry was posted in Defects and Taints and tagged defects, diacetyl, flavors, taints. Bookmark the permalink. As a chemical engineer who is also a craft beer enthusiast, I am really enjoying this blog. I’d love to see a few more reaction schemes integrated into the blog, however, rather than just posting the entire pathway diagram afterward. Thanks for the support, greenlightening. I understand your desire for more info, but I’m trying to walk a fine line between explaining it accurately enough but not getting so complex that I alienate most of the readers. I’ve already seen a number of comments in various places saying that while they enjoyed the articles, much of it went over their head. My target audience is the science-educated homebrewers, microbrewers, and beer drinkers. I don’t expect everyone to have a CE degree. Thanks again! Hope you’ll keep coming back. Wow great article and this is now one of my favorite brewing websites. I long for indepth science and experiments on brewing and this has delivered. Everyone can post about there opinions but few back it up with facts. Thanks. Thanks for the kind words. Glad you like the site. Cheaper GCs can be had at eBay auctions and some online used scientific equipment sites. GC is so fussy to run, though – much easier if there is an HPLC method available. Have you ever observed diacetyl to blow off? I understand that it becomes more apparent as the beer warms, but you indicate that it might be accumulating in the headspace, which makes me think that it doesn’t “sit” in the beer. Any opinion? You know, perceptivebrew, I’m not sure. I suppose theoretically diacetyl can “blow off” (where the concentration in solution drops due to volatilization into the atmosphere), but I think it would be so slow as to be a rather impractical way to lower D levels in your glass of beer. The beer going lightstruck and flat would probably happen much faster. But this gives me an idea which I will try to investigate further at some point. Good work here, thanks. I’m linking a piece on cheese-beer pairings to one of your other articles. Your less technical readers might enjoy two articles I wrote on the causes of diacetyl in beer here and here. Just found your site today – looks good. We test beverages and have some similar outakes and articles if interested. Brewing and Distilling Analytical Services. If you don’t have the cha-ching to buy a GC, you can try a forced diacetyl test. Take 100 mL of filtered beer that’s at the end of fermentation and in diacetyl rest mode (you want it filtered because the presence of yeast may give a false positive result–we filter through coffee filters with DE in the lab), put it in a loosely capped flask with about a 500 mL capacity (you want the extra headspace for this test), and place it in a water bath at 70 degrees C for 15 minutes. Tighten the cap and allow the sample to come to room temperature (about 30 minutes). Invert the sample, remove the cap, and give it a good whiff. If the sample is too hot, you’ll probably get some ethanol in the nostrils. If you let it cool too long, it turns a bit funky. Since the heat volatizes the diacetyl, it will be in the headspace of the bottle if it’s present. Not saying that everyone will be able to detect it, but hand it over to your diacetyl-sensitive brewers and see what they think. We use a minimum of three trained brewers before we deem the beer diacetyl positive or negative. Positive= longer diacetyl rest. Negative= chill/drink/smile. We’ve got our beers down to under 20 ppb using this method. Hope this helps yous guys. 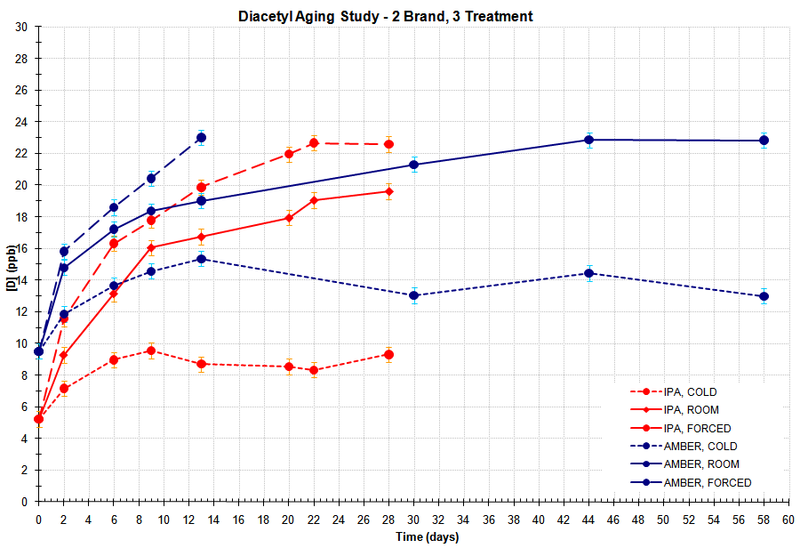 PS Dig the diacetyl aging study. Thanks for the comment, snotbutter. We’ve got a GC for that purpose, so we are able to run fermentation samples to determine the appropriate time to crash the fermentation. But that is a useful technique for a production environment where the fancy toys are not available. It helps to know which of your tasters are sensitive to the compound, and that can be tricky without a GC to verify exactly how sensitive they are, but it’s better than nothing. I did an experiment with dry hopping a beer after only 4 days of fermentation in the primary. I figured that leaving the beer to mature as I usually do in the primary would yield a clean beer with a nice hop aroma. The result was a beer with hardly any hop aroma and diacetyl. I’ve not had problems with diacetyl in the past and wondered if perhaps the dry hopping disrupted the usual work of the yeast to reabsorb the diacetyl. Is this correct? Hi there. My question is actually a similar one to BrewsterNE’s above. I work for a mid-sized craft brewery, and we use the ASBC’s distillation method for measuring VDKs on a Spectrophotometer. We typically only run this test on our batches until the tanks are crashed, and rarely do we measure finished product VDK’s. We recently had some of our [finished] beers tested on a GC to see the breakdown between butanedione and pentanedione, and results show an increase in butanedione in our filtered-dry hopped beer from the day it was crashed to the test date. Compared to a non-dry hopped beer subjected to similar storage conditions, this increase was quite significant. Do you have any theories on how something in dry hops (polyphenols perhaps?) might react with the acetolactic acid to promote more butanedione formation? I really wish that I had taken more chemistry in college! I really can’t say for sure what might be causing that discrepancy in D levels compared to non-dry-hopped beers. Without knowing the specifics of your samples, their collection, and your production methods it would be reckless of me to speculate. About all I can suggest is that adding hops after wort cooling often times introduces various microorganisms, some of which can occasionally contaminate your beer and produce D. But this is unlikely if it is happening to all these products. Sorry I can’t be more help! There’s still a lot about brewing chemistry/biochemistry that I have to learn, and indeed we all have to learn. I believe I read somewhere oxygenation can create an acid precursor which eventually makes diacetyl. This happened to a whole leaf dryhop ale I made recently. Realizing I’m REALLY late to the conversation, but how would you explain Diacetyl in kegs. Only one or two kegs have any detectable levels in them, the rest are all fine, with ZERO diacetyl. Aging or keg contamination are my only thoughts, but the kegs all go through the same cleaning regiment prior to filling, puzzled why it would only get in a couple kegs. I am currently conducting a masters study into Diacetyl flavor threshold levels and I was wondering if you had come across any journal articles that relate to levels of perception based on beer style?